We know. Ridiculously messy, right? It wasn’t that we wanted the garage to be a mess. It’s just that we needed to prioritize other things. And you get that, I’m sure. Well, over the past couple of weeks, we got the whole left side of the garage cleared out (and gave away that train table and all the stuff on it). And we’ve been decluttering every other room as part of our goal to declutter the whole house in one month. Whether this is a project you’re interested in doing now–or at some time in the future, we thought you might like to come behind the scenes with us to hear what’s working (and what’s not!). Alia (our 17-year-old daughter) joined me in this brand new episode of LearnDoBecome Radio, and we’d love to share it with you! How we’ve been kind of decluttering over the past six months. How Alia has been cleaning her own room and deciding what to keep and what to throw away. How we created the general plan. (a) Write down all the rooms you need to declutter—in bite-sized sections. (b) Calendar when you’re going to do them—which order, which days? (Kids will be gone at summer camps for part of the month, so I’ll save the rooms that don’t need their input for those days…) I wrote the dates on that “scribble list” above and then put the rooms on my actual calendar when the dates were decided. (c) Start with the first space you selected! For example, I put “Garage” on Saturday and Monday’s calendar. Then I built time for that into my Saturday when I “Created My Day.” Make the room requirements small enough to fit into a busy schedule…something like 30 minutes to an hour a day. That’s totally doable! 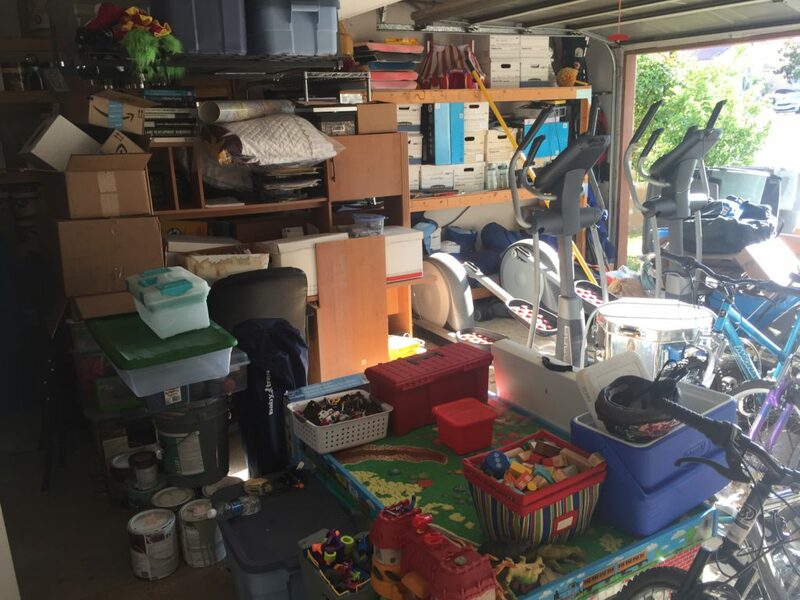 This is where we share the nine things we did when we cleaned out our garage. 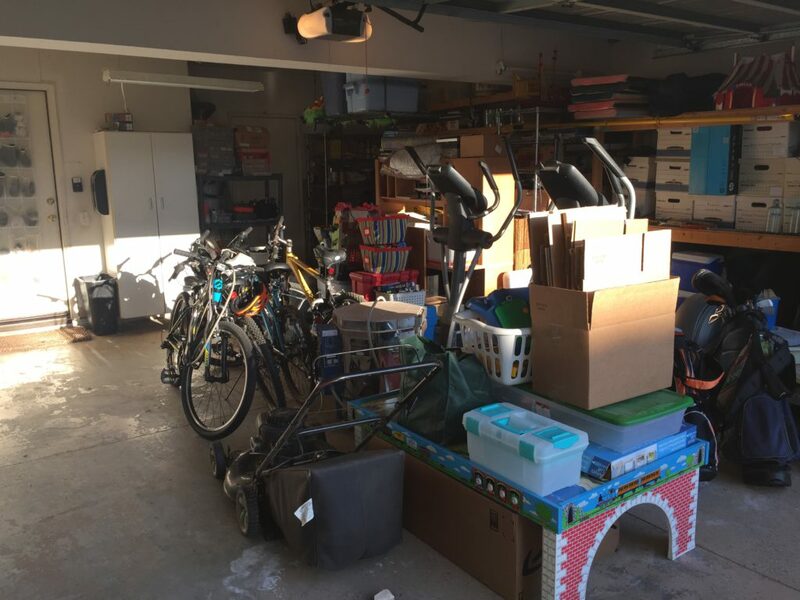 Set a goal to do JUST the right-center of the garage–not the stuff on the left or along the walls yet. Our goal was to get rid of stuff–not to rearrange it. We started a giveaway pile and brought out the recycle bin and a big trash can. Brought in helpers (our daughters). They only groaned a tiny bit. And they disappeared once. But it turned out pretty well! Worked through the emotional attachment. Asked, “Do I actually use this right now? Am I going to use it enough in the future to justify keeping it? Would I buy it again? Does it spark joy? Is there someone who would actually miss it if it were gone?” Our train table, for example, was SO hard to give away, but it now resides happily in the nursery at our church building. Identified PROJECTS inside the clutter (like fixing my bike or creating a new emergency kit for the car). Cleaned, swept, and wiped the walls. It felt SO great. If you’d like to take part, simply identify the room or rooms you’d like to declutter in the next month and then let us know in the Comments section what you’re working on this week! We know you have big goals and full lives. And we know that most of the time, life doesn’t go as planned. But we hope that these little ideas and honest peeks into our lives will help strengthen your family and make things just a little easier for you. Thanks so much for being with us on this journey! Have you attended our free class? New times are here! Thank you Linda. I have started de-cluttering (FINALLY!!) in September 2017 and found kindergarten work of my 14 year old freshman in high school!! Oh my, I should have had Learn Do Become program then!! My daughter was like-” you can throw that, it is really ok” haha! I am overwhelmed! My email is in 60,000 or so… BUT I have to do this NOW so I can truly enjoy life and create stress-free beautiful memories with my children (freshman, 5th grade and 3rd grade)and my super patient husband. Thank you Learn Do Become!! OMGosh, how I wish you’d sent this 6 mos. ago!!! We are in the process of selling our house & have been decluttering for 6 months! Our garage is stacked with packed boxes for the move. We’ve completed all the rooms except my sewing/craft room & it’s a doozy! I’m appreciative of any advice you have. So proud of you!! Way to go getting so much of it done! Small steps–it’s totally possible. 🙂 Good luck with your move! This is timely for my situation. My whole house needs decluttering! I just started tackling the “wall” of clothes in our bedroom and will probably have at least another 2-3 days work in there. We have been in the house 33 years and every nook and cranny is full! We have a lot of sentimental items as we have lost several close family members in the last couple of years. But…I have determined that I must clear out, clean up and reclaim our home. I want us to have a clean, comfortable haven rather than the cluttered mess we have been living in. I also don’t want our family to have to deal with this stuff when we pass away. Thank you for your inspiration and advice. It will help to keep me motivated. Beautiful goal, Ronda! You’ve had a lot going on, and this is an exciting time for you. Thank you!! Rhonda, since you mentioned the sentimental items I was reminded of something I saw years ago of someone in a similar situation. The suggestion was to find something to do with the item… for example, Grandmas favorite shirt was turned into a teddy bear. Some metal and patches were put into a shadow box and hung on the wall. Most items, they suggested taking a picture of and making a small scrap book of all their favorite or special things and donating the real ones. Just some great ideas. I hung onto my grandmother’s robe for years, it made a great teddy bear for my Granddaughters bed! I understand, Maury!! When you have others’ stuff to consider, it can get tricky. I went through and organized JUST the things that were mine first. That at least trimmed it down a bit. 🙂 Wishing you the best!! You must have felt my frustration! ! Today I started in my bedroom. It is started, it is frustrating. I can relate to all of the above other replies. My garage is much worse than you’rs but it is not today’s priority. Your list of questions for the items that have an emotional attachment is helpful. Thank you and all the others for sharing. I look forward to learning your process. Our summer project will be our garage. In the fall, we will be gutting our bathroom and will need open floor space to store the new sinks, faucets, paint, trim, etc. Once we purge and sort, we must create a plan and install shelves and hooks to get things off the floor, possibly a shelf that suspends from the ceiling. Next spring, we will begin the basement. We have much to purge (antique furniture, collectibles, photos, etc) we didn’t have time to address when we downsized 2 years ago. My husband FINALLY has a week off work, next week, and we’re setting up quite the to-do list! Near the top of the list (just under getting our 5, 3, and almost 1 yr olds to actually sleep in their OWN beds ALL night…) is decluttering the master bedroom. It’s the one room I feel totally comfortable telling guests not to enter, which inevitably means that’s where everything get tossed when we clean for company. To add to the clutter, I’ve lost 70 lbs in the past year, since my son’s birth, and now have a massive amount of clothes to get rid of. I realized today that one T-shirt I came across I’ve had since *high school* 😱. I’m 29. That’s just wrong. Also, the baby shares our room, which means all of his outgrown items also end up adding to the chaos! I’ve been decluttering for several months, also. Selling off unused toys, and outgrown kids’ clothes, as I worked my way through their rooms. I can’t wait to finally get mine done, too! We are purging and decluttering the attic and garage and come across items I hope to use again…someday. Horse tack from a used to be avid rider with 3 boys who now aren’t dependent on mom. It could be 5 more yrs. before I own another horse. I’m 52 and seems like I’m always too busy, gardens, fruit trees, dogs, cleaning, cooking, hiking, babysitting and Sunday school teaching among other son focused interests. Prioritize you might say. That’s the problem, I love them all, but sons will help with the gardens and berries more this summer. Cathe- thanks for sharing! This is a hard spot but we are glad you are here! We have a helpful post that https://learndobecome.com/the-three-box-method-for-organizing-your-space/ is helpful. 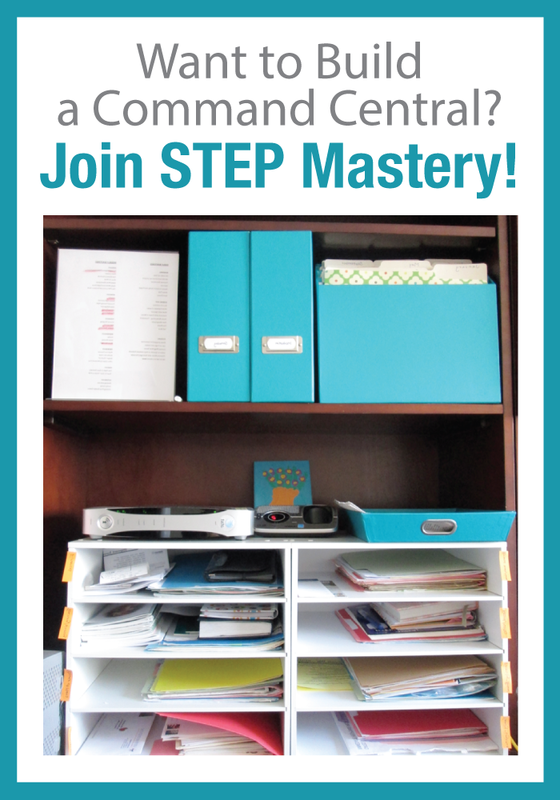 We’d love to have you in our free webinar (www.LearnDoBeceome.com/step) as we can teach you how a command Central can help you get established with moving forward on this big project. Just can’t seem to get them done and keep them in order! Feel like a failure time after time. Parts of our home are good and stay good, thank goodness!! However, the 2 listed, NOT GOOD!!!! Thanks for the helpful advice! 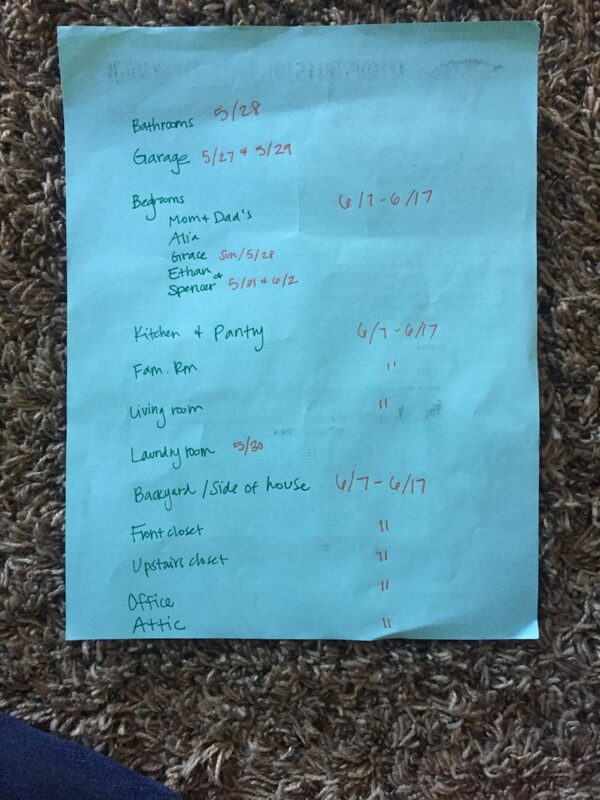 I plan to use your “breakdown method” of conquering my whole house declutter project!!! It is all so overwhelming as a whole, but I think I can do step-by-step to reach my goals. Too much stuff is creating chaos in my life!!! I NEED peace!! I want to be able to have my family and friends once again…..it’s been years since I have let anyone in due to all the clutter!!! The time is NOW!!! Challenge accepted! Our master bedroom is a disaster – mainly because all 4 of us live in this room. I need to find better organizing items that aren’t the cardboard box that’s still packed from our move in October 😵 I got bins the other day and I got pictures up on the walls…but this should give me the last boost I need to just get it done! I can relate we moved here in Jan but still have stuff in boxes due to my mother in law’s passing and having to pack up her 3brdm2ba house and our 3bdrm 2ba house but thankfully we got rid of our furniture and keep hers. Best of luck Patricia C.
I have a huge question- I want to purge/clean my house (4 bedrooms and a 3 car garage that has never seen a car) but my problem is everything has a value. I was raised on welfare and then had a very frugal stepdad. I can’t seem to throw or give anything away. It’s overwhelming. I truly want to start but I seem to just go in circles. I helped my daughter with her room but the things she didn’t want are in the hallway. I’d like to have a garage sale because we could use the money but that’s overwhelming too! I am tired of living like this. I want clean. BTW- as I type this I had to clear a space on my desk for the keyboard. Shameful. How do I start? And more importantly, how do I finish? I understand your opening statements and the overwhelming feeling that causes us to freeze and avoid. I am thankful that you are always pushing yourself and showing your vulnerability. Thanks for being willing to expose imperfections and continue to move forward. I appreciate this podcast on decluttering. I struggle with this all the time. I find that I am attached to the potential of objects as well as sentimental connections. It takes time for me to let go, but I continue to go through the process. Thanks for offering points on the subject and sharing your journey. This podcast was very helpful. Knowing the questions to ask myself as I get rid of things has been a good reason for not getting rid of whatever it is. I know the “does it bring me joy” question but that is a very small factor in decluttering. Especially the task I have chosen for the coming week. I am tackling the storage area. We have things like tools, left over remnants of house remodeling projects, appliances and pans that don’t fit in the kitchen, luggage, extra blankets, cleaning supplies, food because we have very little kitchen space, and boxes for purchased items. The area is so small and has so much stuff, it is nearly impossible to walk in to select a can of food. Your podcast was helpful! I have a lot to declutter. And my inclination is to do bits and never make a meaningful dent. But. I am really going for it! I have just retired and there is much from my years of teaching that needs to go. And stuff with much emotional attachments. There’s a reason I signed up with you, because I’d just as soon NOT deal with it! This week…. my bedroom. Which has become a catch all. I stopped sleeping in it after we had an earthquake and now I’d like to move back in. !!!!! I just read your note. I am a teacher in her 15th Year and have an entire room in my house filled with posters, resources (both purchased and created), binders and supplies that I can’t throw out because I think they are not garbage, i.e. Can be used. How did your de-cluttering process go? What do I do with things other people think are outdated / trash, but I think have some worth? (I have put time / money into these things.) Any tips are appreciated (by anyone). Thanks! I did not see this post until today, but I found it to be perfect timing with what I have been doing around the house! I wanted to declutter our garage in order to get ready for a garage sale, but I also found other things around the house to be a mess right now too. I decided to start with the garage to organize every box and label them clearly since everything was piled into the garage from our move in January. I opened every box and labeled them again and grouped the boxes together by categories. All this took me about 3 hours. My next step is to go through each box one by one to see what we really need and what we can sale, give away, or throw away. Lots to do, buy it’s doable! I like to work on one area of the house for about 30 minutes to an hour and then move on to a different part of the house so I can see clearly and have a clear mind when things can get overwhelming. Joanne, we are living parallel lives right now. 🙂 Excited for you and this amazing progress! I need to restart the decluttering process, or have a plan because we are moving within the next year. Thank you, April and Alia, for this podcast, as I was stuck or unmotivated in the decluttering process, and really need this! I am doing this by myself, as my kids are grown and moved out, and my husband is not on board at all for decluttering. I started decluttering in January with a goal of gathering 20 items a day to put in the trash or give away box. That worked for awhile. Then I started on my boxes and many piles of paper and was getting tired of dealing with that. Then I found the free Learn Do Become Class – it was an answer to prayer in many ways!! I signed up for The Mastery Program and haven’t regretted it for one minute! So, one of my “projects” is Decluttering. I am so thankful for a step by step process and the first room I will focus on this month is my Laundry Room. Thanks again, April and Eric, and Alia!! WoW! I am just now getting a chance to listen to this podcast and this is the PERFECT time for me. I am getting ready for a huge move from the house I have lived in with my kids for the last 5 years, but was previously my parents home for 30+ years. When my dad passed, my mom couldn’t deal with the house, so I got it, along with my dad’s 30+ years of stuff, plus his 3 businesses. I learned my ‘collecting’ behavior from my dad. I ‘may’ use that again and ‘oh, this is great.. I will use that one day.’ My biggest achilles heel was fabrics and crafts (I had a large collection from a store closing 20+ years ago). I decided that I would start with all that fabric in the totes on the shelves. I sorted it by either cottons or everything else. I donated all the cotton material to a church to make quilts. All the other fabrics were graciously accepted by a gal who does costumes. (I actually called her for a contact to a high school theater program, and turns out they don’t make costumes anymore!) I went from 22 large totes to 3 totes of things I really have an interest in and plans for. That cleared over half of my basement storage shelves alone! Talk about a RUSH!!!! I then decided to list out all the areas in this house that need to be emptied and packed. I made the areas small enough that I should be able to do them in 1-2 hours max. I am working on scheduling those areas based on what I think will generate the most trash and making those spread out over several weeks *just before trash day. The other areas are more areas that have items I can donate or include in my final moving sale. I liked the confirmation that only working 1 hour or so on the area is a-ok. I have several medical issues that make working much longer quite difficult. Today I cleaned out the laundry storage area, which for 30 years has held every medical item, soap, shampoo, and hair supply that these 3 generations have used. One hour and 15 minutes later, the whole 4 foot wide by 6 foot tall cabinet was EMPTY! 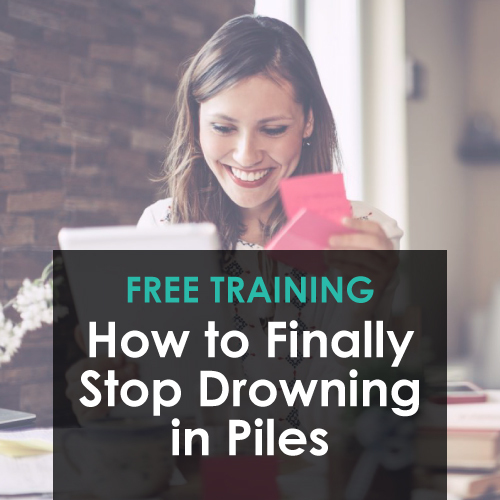 Marie I am in the same boat as you tackling a home is a bit overwhelming and finding the times and things to do to not make pain arise or a set back is the most challenging. We (husband and twin 4 year olds) have lived in our home for almost 4 years and the space is feeling tight for sure, we do need a bigger home but want to wait a few more years first. I tackled 9 totes and big items last weekend for the fall sale here and it seems to be never ending. Just wanted to say good luck and thanks for sharing, gives hope for the rest of our to do list. my hole house needs help every room it is all overwhelming so I’m going to make a list and try to tackle it that way my room is the worst there is so much stuff in there that i have tripped over stuff and fell lol. so i will brake it in to groups of an hour so it will not be overwhelming. any ideas on how to get my 11 year old daughter to let go of things she doesn’t play with or need anymore.? Summer- Great question! one thing that helps us is knowing where toys go to that we are done with. It is fun for our girls to know that they get to share the things they don’t need anymore with someone who would love it. Perhaps consider donating the toys with your daughter being on board, to help her get rid of things that you don’t need anymore. Make sure and keep some favorite toys for your kids and grandkids to enjoy later on! I moved into my house a year ago. The office is becoming my catch all. I squirm at the notion of spending and entire day organizing the whole thing. I’m going to try your approach of eating the elephant one bite ate a time and will allocate and hour at a time to see if that helps me make progress. I’d like to finish within a week. Thanks for your encouragement, April! This is AWESOME, Ann!! So, so proud of you! Loved the podcast. Some simple, practical ideas to clutter. I think it would be great if you could do another podcast on dealing with those in the house who have a difficult time letting go of stuff. Wonder if you or any other listeners have had success decluttering a house when they live with someone who has a reason to hold on to everything? Thank you for your message Julie! We have had great success when our members have started the STEP system and setting an example for their family members. Sometimes our best way of teaching is by example. Have a great day! Lia, that can be so hard! I don’t have ADHD but when I get feeling like you’ve described, I sit down and do a mind sweep. I write down everything that’s swirling around in my head and on my mind. Getting everything out of my head makes it so much easier to see what actually needs to be done right now and what can wait. Have you attended our free class? We’d love to have you join us! We focus on four simple steps anyone can use to get a better handle on life, home, goals, projects, and tasks. 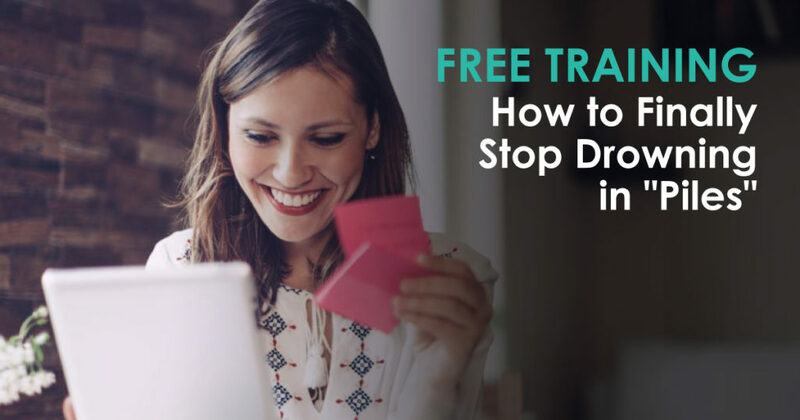 Follow this link for more info: LearnDoBecome.com/STEP. Hope to see you there!